Last month I got a few boxes of Girl Scout cookies. Ever since then I have been craving mint chocolate flavors. Today I have two treats for you. 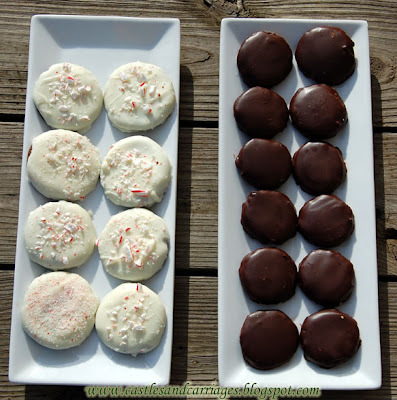 Dark chocolate dipped peppermint patties and white chocolate dipped peppermint cookies. 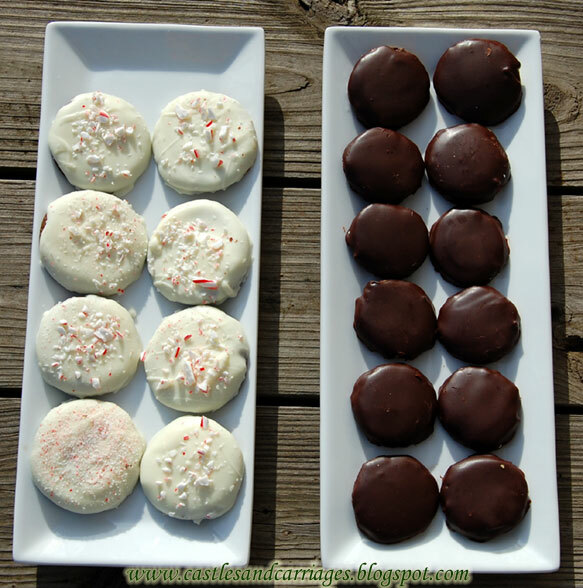 Once cooled, the chocolate cookies hold up better to dipping than the peppermint patties. I found it easier to place the patties on a wire rack (with a cookie sheet underneath to catch the chocolate) then pour the chocolate over the top using a spoon to thin out the chocolate on top of the patty. The peppermint patties were prettier and had a glossier finish than when I had initially tried to paint over the patties with a pastry brush. 1. In a large mixing bowl, combine condensed milk and peppermint extract. Beat in enough confectioners' sugar, a little at a time, to form a stiff dough that is no longer sticky. Form into 1 inch balls, then place on waxed paper and flatten with fingers to form patties. Let patties dry at room temperature two hours, turning once. 2. In a medium saucepan over low heat, melt chocolate with shortening, stirring often. Remove from heat. Dip patties, one at a time, into chocolate by laying them on the tines of a fork and lowering the fork into the liquid. Or you can pour the chocolate over the patties as I describe in my post. Let cool on waxed paper until set. Preheat oven to 325 degrees. Sift flour, cocoa powder, baking soda, baking powder, and salt into a bowl. Beat butter and sugar with a mixer on medium-high speed for 1 minute. Reduce speed to medium-low, and add egg, then yolk, beating well after each addition. Beat in peppermint extract. Slowly add flour mixture, and beat until just incorporated. Shape dough into 2 disks, wrap each in plastic, and refrigerate until firm, at least 1 hour (or up to 2 days). 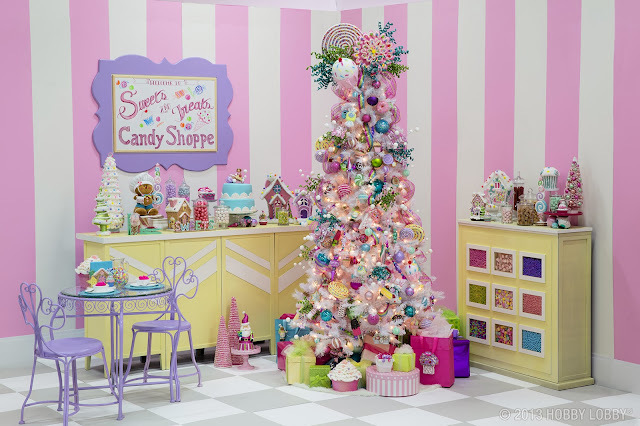 Sift crushed candy, and separate larger pieces from dust, reserving both. Melt chocolate in a heatproof bowl set over a pot of gently simmering water. Remove from heat. Dunk cookies into melted chocolate. Using a fork, turn to coat, let excess drip off, and gently scrape bottom against edge of bowl. Place on parchment-lined baking sheets, and sprinkle 1/4 teaspoon of either candy pieces or dust on top. Repeat, sprinkling half the cookies with pieces and the rest with dust. Refrigerate until set, up to 3 hours. Decorated cookies are best served the same day. 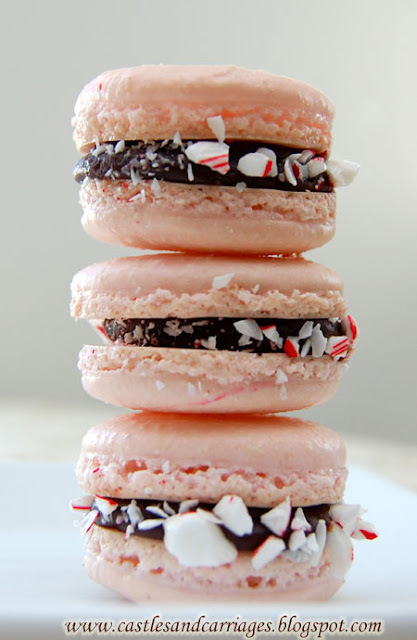 Yum...peppermint cookies. Now I want a box of Thin Mints, oh wait, I can make my own now! Thanks! Both of these are beautiful - they're perfect for the holidays. I'd like to invite you to share your recipes on Sweet Indulgences Sunday.